Advanced Metering Infrastructure (AMI) has reached new heights with SATEC’s latest introduction in energy and power quality measurements for smart grid deployments. * For bottom-up connection (DIN standard) see EM720. The EM920’s unique “Add-On” modularity is the key to its remarkable versatility and unprecedented effort to add intelligence, control and communications to electrical metering. 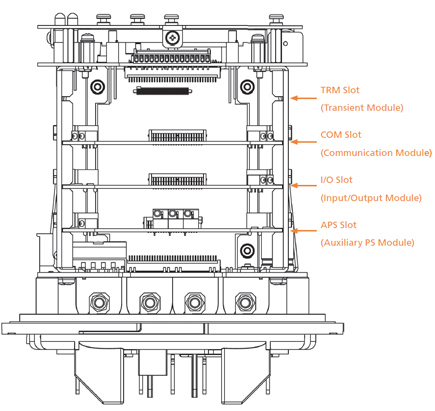 SATEC’s “Add-On” module concept allows you to configure the meter to your changing needs, thus saving valuable time in the field or future costly replacements. Technological advancements revitalize legacy applications to rapidly and cost-efficiently respond to changing market conditions. The Model EM920 eXpertmeter™ is an advanced energy meter that exceeds Class 0.2S class revenue billing requirement. It provides long term memory for load & trend profiles, and includes advanced power quality analysis to detect and record waveform events and fault currents harmful to power systems. The EM920 eXpertmeter™ is MET certified. SATEC EM920 is offered either in Form 9S construction or with a wide range of adapters and enclosures. The EM920 eXpertmeter™ Series is used in electric utility inter-ties, any electrical substation where precise information is required for planning purposes, and monitoring primary customers on the service entrance to provide a higher service in quality of power. Install at legacy substations where little to no information is currently provided. Just replace existing socket meter and instantly provide information previously unattainable. Long term monitoring and storing capabilities allow for many months of information storage. Record Time Of Use (TOU), load profile, Min/Max, custom reports etc. - essential information used for planning and maintenance engineers. Multiple simultaneous communications allow communication via MODBUS, DNP3.0, and MV90 while retrieving power quality events such as SAG/SWELL and transient detections. View Harmonic conditions locally to determine the cause of problems by utilizing its unique “Directional” Harmonics Power flow. View real time Oscillography and determine quality of power.